How often do you usually travel? Where do you find the best traveling deals? How do you move about in another country and where do you stay at while you're abroad? Personally, I would LOVE to travel as much as I can after I graduate from school. But I just don't know where to start. There're so many places that I want to visit and I have to strategize on how to spend my money wisely on flights, accommodation and transport. 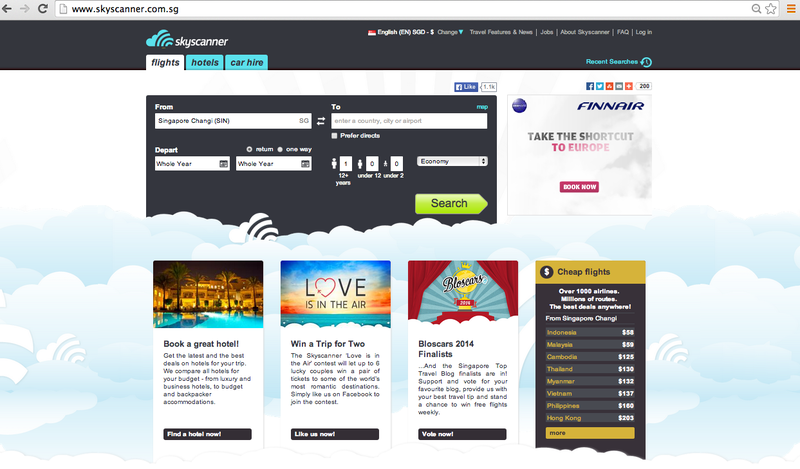 Thankfully, with Skyscanner, these elements can all be planned more efficiently! First of all, Skyscanner is a leading global travel search site that provides instant online comparisons for millions of flights on over a thousand airlines and travel agent sites, as well as car hire and hotels. They've been around for 10 years now and have over 25 million unique visitors using their site every month to find flights in more than 30 different languages. The super awesome thing about using this site is it's flexible search options, which means you can browse prices across a whole month, or even a year!!!! Thus, ensuring you to get the best deals. A travel website that is fast, flexible and finds the cheapest flights, hotels, and care hire, with no added fees and no fuss, what's there not to like? They also have a mobile app so you can search and book on the go. Even though Skyscanner has already held the Anywhere and Everywhere Contest, you still have a chance to be the lucky winner of a pair of tickets to 1 of 7 chosen destinations! All you have to do is to head over to www.goeverywhere.sg to follow the chosen Anywhere and Everywhere winner’s journey and subsequently, take part in the Selfie contest! The Selfie contest will be open for 72 hours for each destination! After which, it will stop for 48 hours before the next Selfie contest starts. You stand a chance to win a pair of tickets to one of those locations he is travelling to! Of course I would pick this exclusive item! In this day and age, it's tough to find unique pieces so when it's an SSD Label, you know that you won't be able to find it anywhere else! This pretty romper would be perfect for Sunday brunch dates or accessorise it like me and you're ready for a party! Available in White, Blueberry and Burgundy as well. I've been eyeing on this trendy mesh insert top for the longest time and I can finally have it! hehehe. Mesh is definitely IN, so is everything futuristic-ish. I'd paired it with classic floral shorts and updated it with a pair of transparent heels, all ready to make a statement! I call this casual, but better ;) Oh, and I have to say, this top is SUPER COMFY?? You'd think that mesh is itchy right? But this one doesn't bother me at all. I could wear it all day long.